Hello Chirpers — I’m back. Sorry for the delay. Here is a cross I made for a silent auction for a Faulkner County Circle of Friends event. The proceeds of the auction benefit Arkansas Children’s Hospital — an organization I am passionate about supporting!!! I have been working diligently on several projects that I’m going to get out here for you to see. 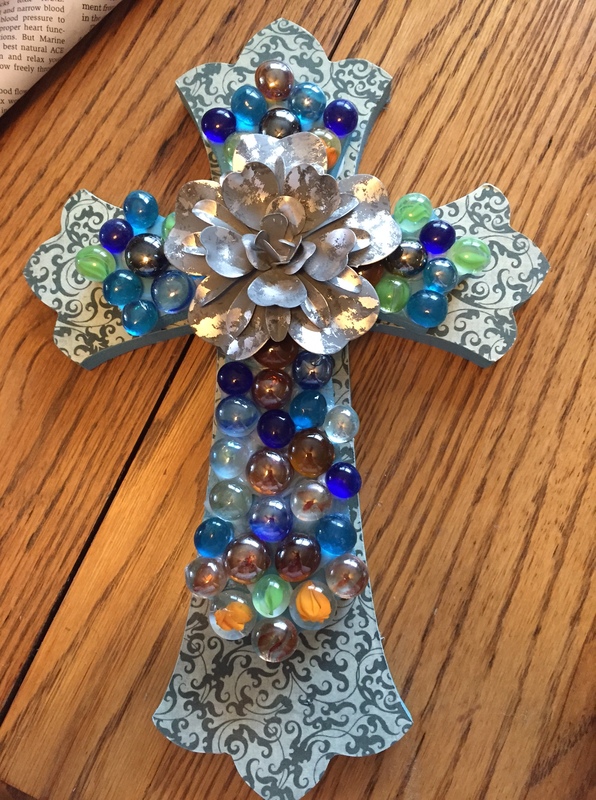 The first is a Glass Marble Art Cross. This was the first time I’ve tried a project with the glass marbles. As I was at Hobby Lobby looking at supplies a really nice lady asked me if I wanted some advice….OF COURSE…..(I wish now I had gotten her contact information!!!). She suggested the use of a power grip glue found at Home Depot instead of the regular glass glue. First I spray painted both crosses with a Teal colored Spray paint as preparation. I color coordinated the spray paint with the scrapbook paper I chose. Next, I used Spray adhesive and sprayed the top of the cross and placed the Scrapbook paper on. I let this dry for 24 hours before using an Xacto Knife to trm around the edges. Finally, I finished by coating the paper with Glossy Modge Podge for a sturdy glossy finish. I used the LocTite Power Grip — suggested by my anonymous friend, to attach the metal flower to the center of the cross. The LocTite worked great, i found it in the Paint section of Home Depot – It comes in a tube AND a caulk tube for larger projects. It has incredible hold and dries CLEAR!!!! The great thing about the metal flower I chose, is that it was on a spring — so it was easy to raise up to get under. Next, I placed the flat marbles all around the cross placing it in dollops of the Power Grip. Don’t get too much, because you don’t want a ton showing, but you don’t want too little, because you want to make sure you have a strong grip on the marbles. Don’t worry if some comes up around the marbles — it does dry clear and looks great! As a final step when both crosses were completely dry (I waited 24 hours) — I used the Power Grip to glue the smaller cross to the larger cross! Mix and match the marbles and the paper and have fun with it. I used mixed colored marbles, but you could easily go with all same colored marbles.